[Shanni] and [David] found enough parts to make not one but two AM CW radio transceivers. The circuit was constructed out of a quad NAND chip. The receiver is old school with a capacitor and inductor with a germanium diode – something I did not see in the part bins. Wireless power is all the rage, it seems and [Luke] and [Chris] built a device that could transmit power over a small distance. Yes, it’s more akin to an RFID tag with a few hundred feet of magnet wire wrapped around the edges of one badge. With this coil and a capacitor, this badge picks up RF and gets just enough power to make a few LEDs blink. At the Supercon, [zakqwy] gave a talk on his project, NeuroBytes. Each of these tiny boards emulates a single neuron, with ribbon cables serving as axions. Connect 302 of these NeuroBytes together, and you could potentially have a C. elegans wriggling around. [zakqwy] isn’t using his brain on a badge for anything useful, though; he’s just using it to blink a few LEDs. As good a use as any, really. Not all of the badges necessarily worked, mind you. [Alan] took an ESP8266, TFT LCD, a Teensy, and a bunch of APA 101 LEDs to display his name on a WiFi-connected badge. Perhaps we didn’t allot enough time for badge hacking, but in true get-it-done fashion, [Alan] managed to write his name on his badge. He used a Sharpie. The badge hacking judging portion was broken up into three categories: best deadbug, best blinkey, and most over the top. Given the complete lack of structure or form imposed upon our mad modders by the minimal badge, the dead bug category was by far the most diverse. [whosawhatsis] turned up at the Supercon and put together the most dead bug-looking dead bug badge. 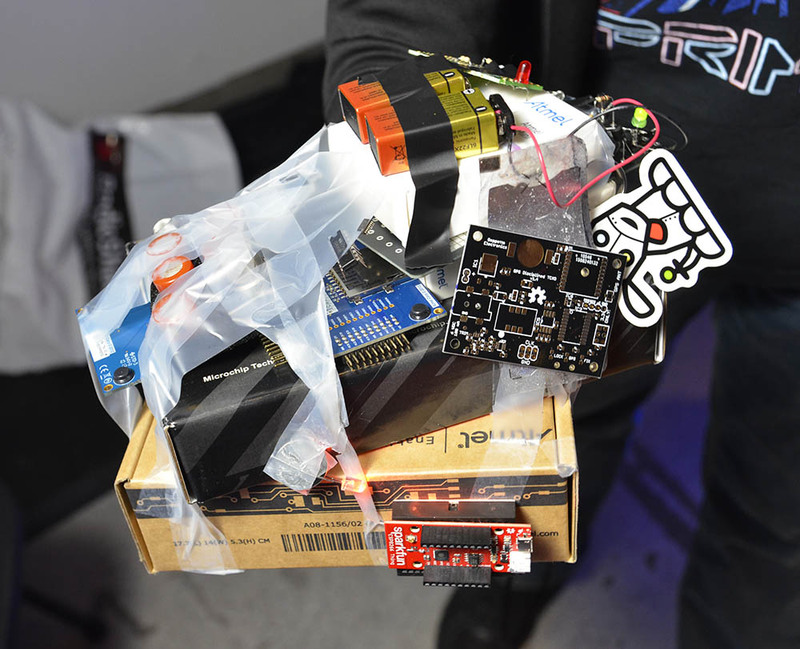 Taking things to an extreme was one insane attendee that managed to put everything on a badge. 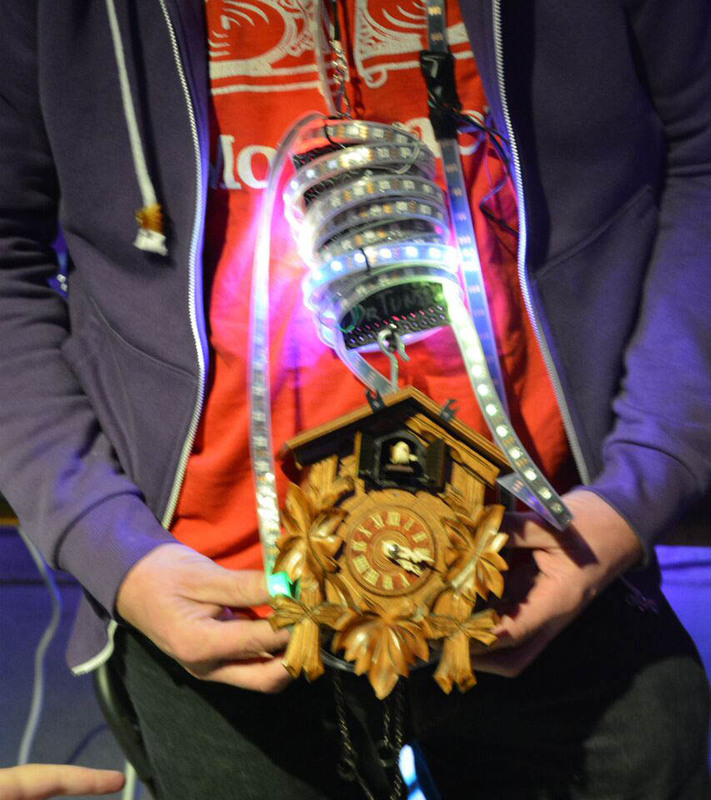 This badge began with a monstrous 4S 10000mAh LiPo battery and five meters of individually addressable RGB LEDs. The original plan was to grab a 50 Watt ultraviolet LED, but this was lost to the wastes of the parts bin. Instead, a cuckoo clock took its place. 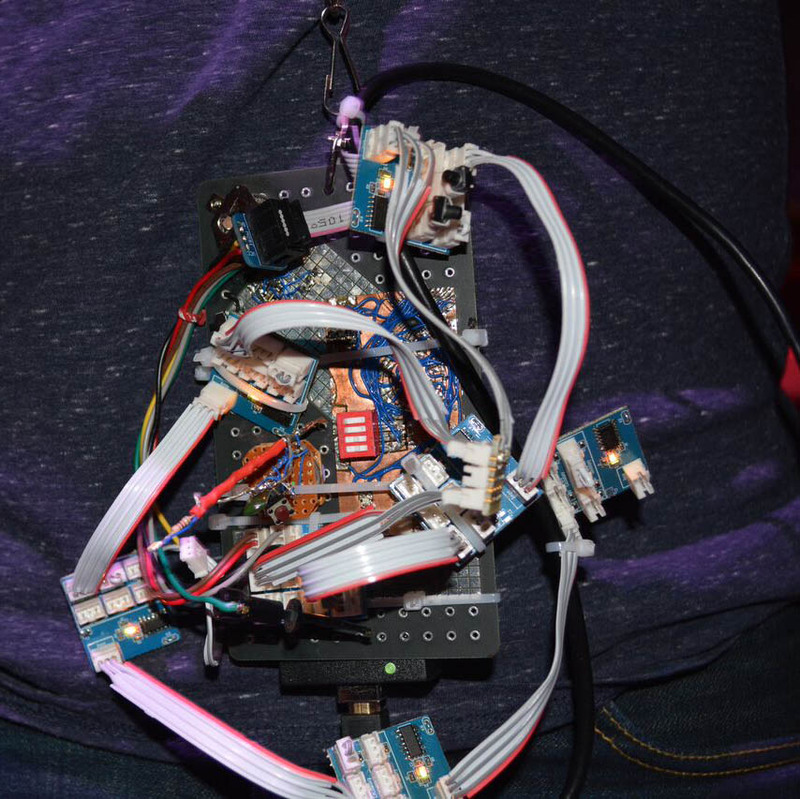 Not to be outdone in the ‘blinky badge’ category, someone managed to turn his badge into a rotating POV display. With 10 LEDs soldered to the front of the badge and a Teensy, 9V battery, linear regulator, and a bunch of code, the POV badge managed to display ‘HACKADAY’ when spun about in the air. This POV badge had all the code to display numbers and letters; a neat bit of work that was probably due to having the badge hacking judging happen on the second day of the talks. Those extra 12 hours or so late at night were enough time to give a lot of people the time to write some code, find some hardware, or stumble upon a cuckoo clock. All in all, a great showing from everyone. 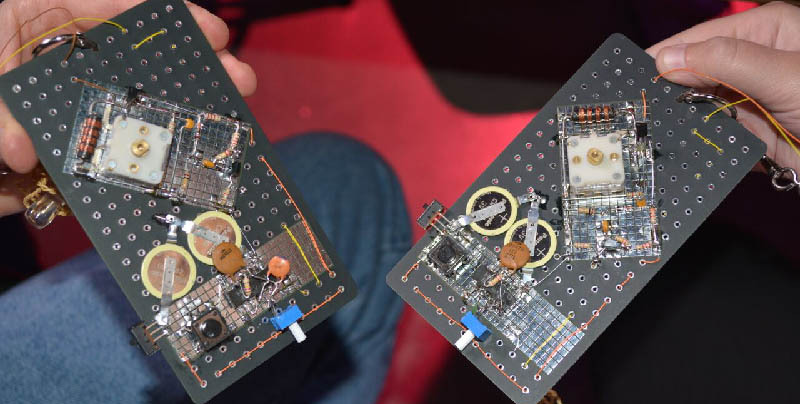 There were a lot of Teensies floating around the Supercon thanks to [Paul Stoffregen] and his microcontroller audio workshop, there were more than enough microcontroller boards for all kinds of badge hacks. These Teensies are great at USB, and [Bharathi] used his badge for a game controller. Soldered directly onto the badge was an MMA7455 accelerometer that was sitting around the parts area. By tilting the badge, [Bharathi] outputs directional commands to whatever game he’s playing. [Rocky McCleary] didn’t just build one project on his badge, he built them all. Because the badge hacking contest had a ‘most over the top’ category, [Rocky] figured the easiest way to go about this was a roll of scotch tape. We had gaff tape, too. [Rocky]’s badge consists of a few boxes full of dev boards from the Hackaday supply cache, a few batteries, some Sparkfun boards, and apparently all of our carbon monoxide gas sensors. It’s not the most complex build by any measure, but it is a great example of how much stuff we had sitting around. This year’s Supercon badge was extremely simple, and most of that was due to the time crunch; we had about six weeks to take this badge from the conception of an idea to production before handing out hundreds to all the attendees. Even though this year’s badge was just a piece of FR4 and a few through holes, we ended up with one of the best badge hacking sessions I’ve ever seen. We may have stumbled upon something great here. Because the Supercon badge didn’t have any electronics whatsoever, everyone who wanted to hack the badge was given a blank slate. It makes sense the most minimal electronic badge ever given out would produce such a diversity of hacks. If you’re given a badge with an LCD and a Propeller chip, you’re going to build something with a Propeller. 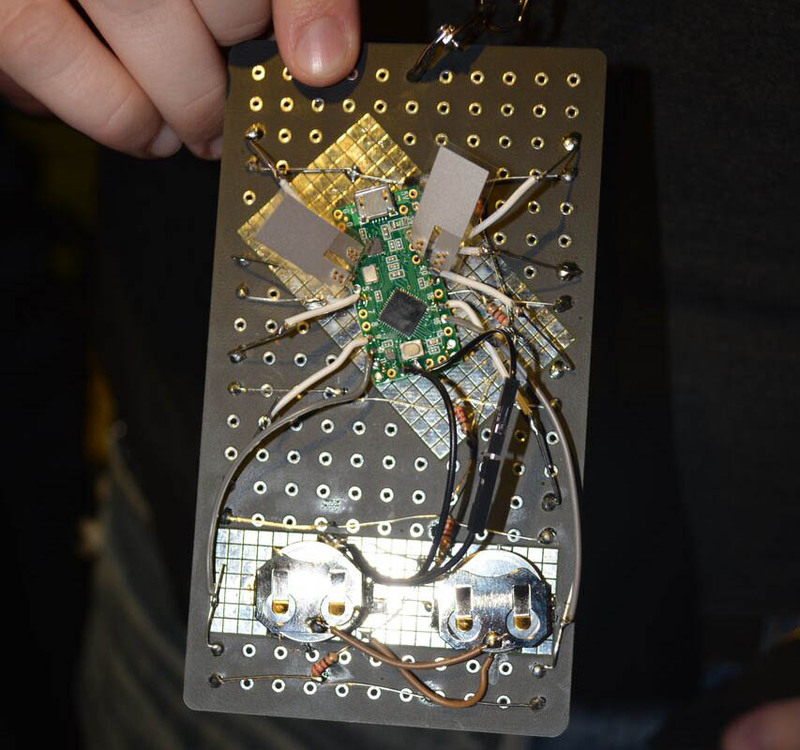 If you’re given a badge that is a HackRF clone, all the badge hacks will have something to do with software defined radio. A ‘blank slate’ badge turned out to be a great idea, so already we’re planning the badge for next year’s con. I’ll be designing it. 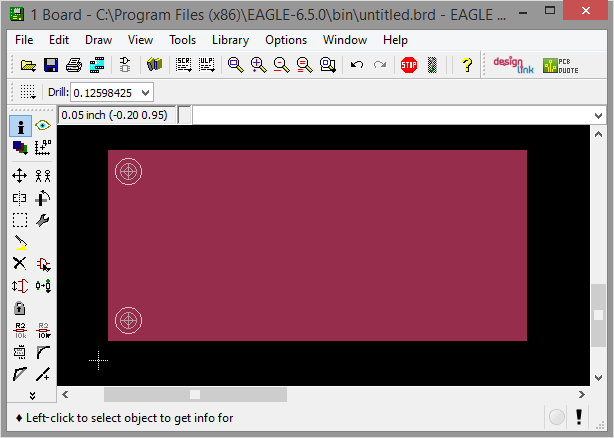 I’ll be designing it in Eagle, no less. Next year’s badge will just be a piece of FR4, with copper on both sides. There will be a few holes for the lanyards, and we’ll probably do something with the solder mask and silkscreen, but next year’s badge will continue this ‘blank slate’ philosophy. There were suggestions that we just give people fiberglass, copper, and resin. 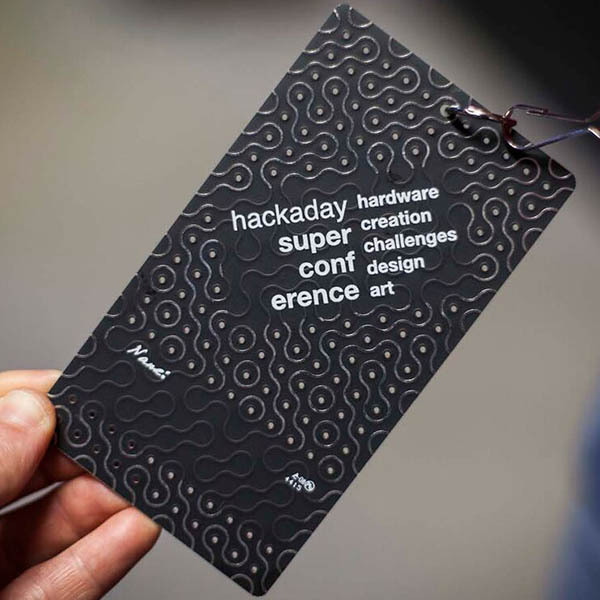 Somehow or another, the Hackaday Supercon stumbled on the perfect formula for badge hacking. The ‘blank slate’ badge is the design for hacks that exude creativity. Sounds like a lot of fun! Some really creative badges there. Nicely done, all! The “most over the top” badge hack begins at 17:36 in the video! That badge is amazing!!! It’s something I would pay money for just to keep and play around with. Rather than just a bare board, how about a board with several flavors of MCU and a bunch of sensors, peripherals and connectors which just lead to thru hole solder pads with perhaps just ground and unconnected Vcc solder bridges for each part. If everyone is expecting a bare board it will mostly result in prebuilt stuff getting attached to the badge. A bunch of unconnected but easily connectable parts would put everyone on an equal footing with a multipurpose breadboard. It would also be a great marketing tool for chip makers wanting to promote products they just introduced.. So you could probably get all the components for free. The design might also turn out to be a useful prototyping module. SMD parts are a bit awkward to use in extemporaneous designs because of the fine pitch leads. This is quite possibly my favorite thing. It’s the attitude we all need to have. Playful discover with the only consequences being that you had fun and probably learned something. I also like it that he still presented his badge — it doesn’t have to work to be awesome and you should be proud of your work! Yes, probably should have had a separately awarded, “Most number of things tried” type of award (separate from popular judging). Could be lots of other similar call outs for people doing crazy things. Just a suggestion for next year’s badge. I was there and in the context of that room, that would have been a disaster. … or milling them? There was an Othermill around, maybe people could have used that. I have a sneaking suspicion the people who loaded their boards up with tons of stuff, were just looking for a way to take home a lot of cool parts. Most of the parts used were from the free stuff in the swag bags, or parts from the workshops, or stuff people brought with them. Some parts and supplies were up for grabs at the event, and several people brought stuff to share (I certainly did). If you just wanted to hoard parts, you certainly could have done so without building anything. Maybe some of that happened, but the event sure didn’t *feel* that way. It truly was an inspiring atmosphere where a good number of people really got into building something on their badge. No, we have a lot of love for it. We’re working on standalone posts for your badge and for the audio spectrum analyzer. Ah cool :) If you need more pictures or a schematic, feel free to poke me. I think EVERY badge was awesome. Also, the Badge needs to go up on hackaday.io as a project. I was slightly interested in your comment (I did the cuckoo clock badge above) until I googled the gmail you’re plugging and saw you’ve plastered same comment all over the web. Thanks for the teensy – didn’t use one on the badge. It looks like I need to get my badge together a bit better next time.